The peculiarity of this rice dish is that it is baked in the oven, as indicated by the name itself. Just like paella and other Valencian rice dishes, it is humble in its origins, made using leftover stew, which is why the ingredients include chickpeas, pork ribs and morcilla sausage. 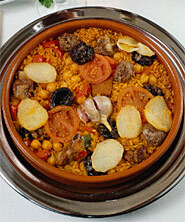 This dish is highly typical of areas such as La Costera where the National 'Arroz al Horno' Competition has been held for years, in the town of Xàtiva. 1/2 kg. pork ribs, 1/4 kg. dry blood sausages, 1 head of garlic, 2 tomatoes, 250 gr. rice, 2 medium-sized potatoes, 125 gr. cooked chickpeas, olive oil, salt. Lightly fry the meat, sausages and garlic in an earthenware casserole. Then add one tomato and stir the rice around the casserole a few times. Lightly fry the other tomato in slices. Add a double measure of water, season and add the pre-cooked chickpeas. Slice the potatoes, lightly fry them and place them together with the tomato on top of the rice. Bake in the oven until golden brown on top.